Earlier today I heard a piece on the radio about pay disparity between men and women in some of our country’s most well know companies. Apple, Expedia, Facebook, Microsoft and others were named as companies that have–under the pressure of advocates for the radical notion of “equal work for equal pay”–incorporated into their company culture the commitment of base-salary parity between the sexes. The discussion turned then to parse out a deeper divide: that the “compensation packages” between men and women can differ to the degree that the entrenched practice of paying women 61 cents to a man’s dollar remains. The jobs I have held have ranged from camp counselor to pizza maker to child abuse investigator to law clerk to public defender. None of those vocations came with an attendant “compensation package.” Knowing the hourly rate or salary before even submitting an application or resume, I went into each interview with the sole objective of getting the job. When I applied for these jobs, minimum wage or for the posted salary was going to be pay pay. That piece of “coming to a number we could all agree upon” was not part of the hiring process. For the last thirty years, I’ve been employed albeit with varying degrees of time commitment. Not once did I have to advocate for why I thought I deserved in “compensation.” Moreover, never was there a time that I asked for a raise: either I left the job, like when I went off to college or when camp ended, or my “raises” simply happened according to whatever contract had been worked out long before I became an employee. “That” has taken on many different forms. From an out-of-season watermelon to tickets to see a musical in Boston (or even in the suburbs if it’s been a particularly rough few months), “that” could be nearly anything and oftentimes everything. Late March is the time of year when I gather the documentation to prepare the taxes. I made close to nothing last year. Really. The Modena Vertical Channel Shelter Leather Platform Bed at Restoration Hardware costs more than I made in 2016. (And that’s the queen size version.) At first when I pulled up my 2016 business banking information, I thought, “No, that can’t be right.” Well, it is. Is that how Corporate America sees its wonderful “packages?” As offsets for loss and suffering? Does Corporate America realize how the work it asks of human beings ends up absenting these people from their family and friends, or even lonely house cats? Does that gigantic carrot let Corporate America off the hook by appealing to the idea that all that “compensation” makes the loss and suffering a little less awful? The last new car I bought was in 2004, when the car was four years old with 48K miles. I don’t care. That car now has 132K miles, large patches of rust that ought have been dealt with years ago, and a broken glove box latch. Who cares? Not me. I see my car as a tool to get me from Point A (usually my house) to Point B (usually the yoga studio or the grocery store) and back to Point A again. 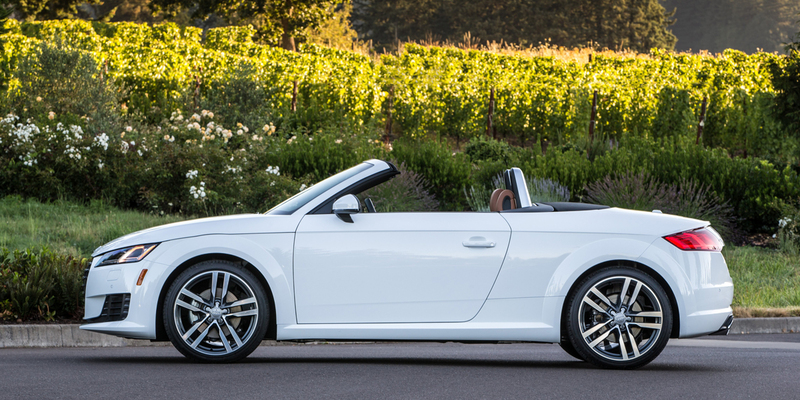 It’s true that when I see a brand new Audi TT convertible, I think, “Wow. That’s nice car.” And then comes my reality: I’d need to work ten 2016s (with no expenses) to buy that car, or I’d have to trade my peaceful, “compensation package”-free life for one filled with loss and suffering. Yup. For “loss and suffering”. It was a good choice for a name. I agree, those “compensation packages” do indeed look wonderful, but the “loss and suffering” required to earn them does not. I decided long ago that corporate culture was not something I wanted to strive for, and have made peace of sorts with my poverty. These are the choices we make in life. Long live the long suffering writers! Thought provoking for sure, Jenna. This provided fabulous conversations between myself and many other people I shared it with. Bottom line for me: YOU are a fortunate soul!! I’m personally thankful for all of those who do enjoy corporate America and who do choose to enter into “compensation packages”. Were it not for them, (those that are compensated for work they do and not their time away from home) many others in our society couldn’t live. It really does take a balance of people willing for various occupations and lifestyles. I assume this is really less than 1% of America that engage in compensation packages in their true form. Like you, I don’t consider my university salary along with healthcare and leave benefits a true “compensation package” due to it not being negotiable or based on corporate standings, etc. Instead I have “deliverables” that must be completed in order for me to keep my job and feed my family. For this, I am very grateful and compensated adequately. I don’t feel as though they pay me for the pain and suffering of not being in my home and with my children, but for my skills and abilities in my chosen profession. These are things that make the world go round. The system of work in exchange for money is a necessary evil in my mind. On the other hand, you’re very fortunate that you have been afforded a life where “yoga studio” is in your daily repertoire. Point A to Point B for some might be from their unsafe neighborhood to a factory job and back to an unsafe place to pick up their child(ren) from daycare (point C) and back home. So, having choices to arrange your life to write and edit creatively is a privilege or an anomaly in and of itself. Most Americans do not get to choose to pursue their creative side, practice yoga, ever see a production in a city (or a suburb), buy a watermelon out of season, surf the web for expensive queen-sized beds, buy a car (new or used), or have new convertible Audi’s within their view or even have a profession they’ve chosen. They are too busy thinking about tomorrow’s meal, this months rent, their personal safety, or are addled from lack of healthy food, poor working conditions or traumatic childhoods. I’m so thankful too for people such as you who have made the time and have the opportunity to write in order to create space for people to think and reflect on how great our lives (those of us who have the luxury of reading a great blog written by a really great person) really are and how much more we could all be doing to help and support women with inequitable wages or people who don’t get to think about retirement or life beyond this earth due to their immediate needs not being met. Thanks, Jenna, for all you bring to life! I’ve been thinking about your reply since reading it days ago. I think my response will be best handled in an upcoming blog post. Thanks for being thought provoking yourself.